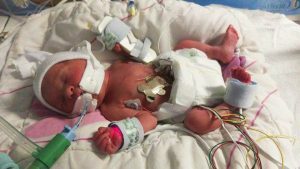 My daughter, was born 10 weeks premature and suffers from Central apnoea, where her brain forgets to tell her lungs to breathe, this is because she was so premature. Her first episode was at 8 weeks old, at home, we called an ambulance and had to do CPR. She was rushed to hospital and was on oxygen therapy for a couple of days. We were all ready to be discharged from hospital, when she had 2 more attacks in front of the consultant in the space of 1 hour, both times needing CPR and chest compressions. They decided to keep her in for more test. She stayed in hospital for 2 more weeks, and didn’t have any more attacks, the consultant was talking about sending her home. We requested the apnoea monitor she was using in the hospital, but they didn’t have enough to send her home with one, if we wanted one we had to source one! Now we were rapidly approaching Christmas and the monitors cost almost £1000 to buy! 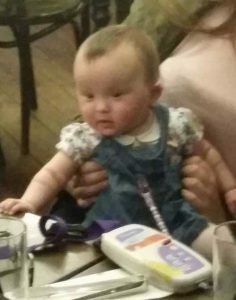 Thankfully a mum we met in SCBU had heard of a charity that supplies the monitors, so after frantic phone calls and emails, we managed to secure one which was delivered on Christmas Eve. We didn’t want to risk trying it out at home, so we agreed to stay in hospital over Christmas to make sure it worked okay. Boxing day our daughter is discharged, and it’s fantastic to have her home again. However, this was short lived, we put her to bed on the 29th December and the alarm on her monitor went off at 3am waking us up, again my partner had to perform CPR and we called an ambulance, she was rushed in again, this time in hospital until 8th February, during this time she also caught a cold virus which turned into a lung infection and she had to be put on a ventilator and paralysed so her body could fight the infection. She still requires the monitor and I can safely say it has saved her life. Thank You to NARA a wonderful charity for all their help.